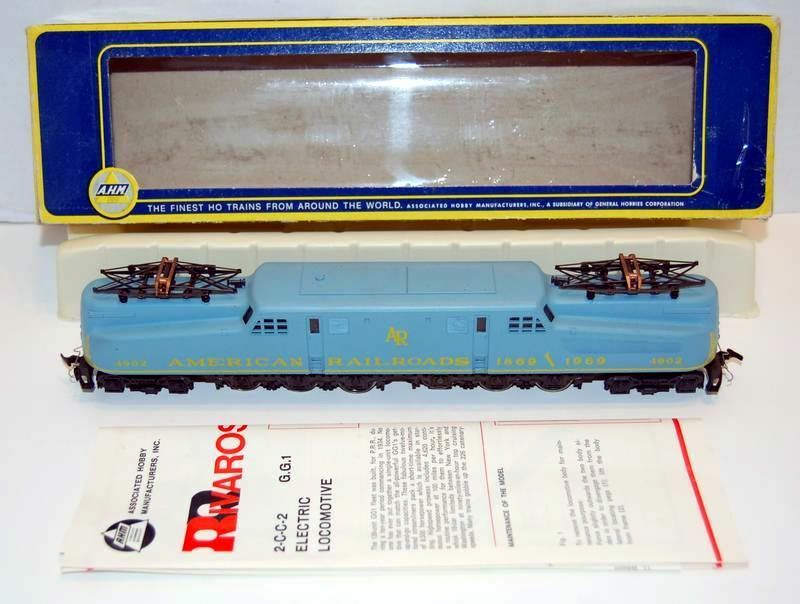 AHM's 1980 catalog features this version of the Amtrak GG-1 on its cover. Additionally, that year's catalog includes this same Amtrak GG-1 powering the company's National Limited (No.67834) train set. As an individual release, I find this silver, red with blue stripe Amtrak GG-1 only in the 1980 catalog and it sold for $119.98 that year. AHM lists this GG-1 as a Limited One Run Only offering in a 1977 ad announcing its release. The production run is stated at 2700 examples. 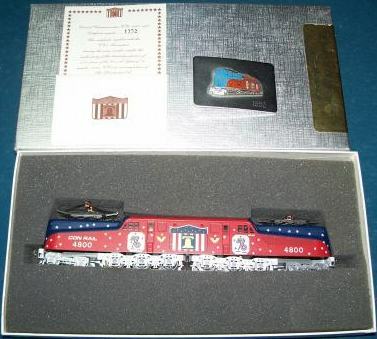 The retail was $99.98 and the loco was presented in a 17" x 7" x 3-3/4" mahogany box with red velvet lining. Perhaps the longest lived example of the Rivarossi-made GG-1 in the AHM line is this example. A 1973 AHM price list calls for a $39.98 retail price. The August 1977 price list has this same model at $59.98. The 1980 price is $119.98. The "-B" stock number is the original dating back to 1970 and the model's introduction. The "-02" comes along in the late '70s. The model's final appearance for AHM is found in the 1981 catalog and that year it carries the "17011" stock number. Rivarossi of Italy later sold the GG-1 model under its own name in the United States. This silver Pennsy GG-1 appears to enter AHM's line in the late '70s, though it is gone from the line according to the 1981 catalog. AHM's 1980 price list states this silver Pennsy example carried a retail price of $119.98. 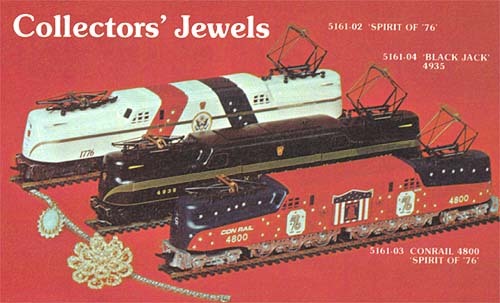 AHM's GG-1 is featured in Model Railroader's Trade Topics column in the May 1970 edition of the magazine. The then-new HO-scale GG-1 imported by AHM is reviewed beginning on page 19. The GG-1 was built by Rivarossi in Italy for AHM. The prototype GG-1 was a General Electric offering sold originally to the Pennsylvania Railroad beginning in 1934. By 1943, G.E. had produced 139 GG-1's. The final year AHM catalogs the GG-1 is in its 1981 product catalog. Rivarossi of Italy, who manufactured this model for AHM, did sell GG-1 models under its own name following the early '80s departure of this electric from AHM's roster. Though some many assume that IHC's recent offerings of the GG-1 are the same model as the former AHM, this is not the case. I have confirmed with IHC that the tooling it has used in recent times is based on the former Pemco GG-1 offering.